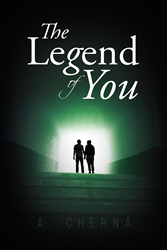 “The Legend of You” from Christian Faith Publishing author A. Cherná is an insightful and intricately woven novel about two friends, one of whom is a believer with a life-changing assignment to save the skeptical other from eternal damnation. “The Legend of You”: a stirring narrative of God’s pursuit, is the creation of published author A. Cherná, a Christian writer and debut novelist. She nurtures an actively creative spirit and lives in Chesapeake, Virginia, with her large family. Published by Christian Faith Publishing, A. Cherná’s new book is an enchanting and thought-provoking tale that dramatically weaves biblical truths into a spiritual experience of a lifetime. View a synopsis of “The Legend of You” on YouTube. Consumers can purchase “The Legend of You” at traditional brick & mortar bookstores, or online at Amazon.com, Apple iTunes store, or Barnes and Noble. For additional information or inquiries about “The Legend of You”, contact the Christian Faith Publishing media department at 866-554-0919.